What was reported was a small-scale trial (257 women) of a treatment for one of the most aggressive forms of breast cancer – HER2 positive. This subtype of breast cancer takes its name from a protein that spans the cell membrane and can pass a signal from outside to in. That makes HER2 a ‘receptor’ – you can think of receptors as two blobs of protein joined by a wiggly bit that sits across the cell membrane. When something sticks to the outer bit the receptor changes shape to accommodate it. It’s rather like shaking hands with someone: the shape of your hand changes as you grip theirs. The clever bit is that a relatively small change in the blob on the outside of the cell is transmitted to the blob on the inside via the trans-membrane bridge (or wiggly bit). HER2 is unusual: rather than having its own messenger floating around in the circulation, it gets switched on by sticking to another cell surface receptor – such receptors are rather touchingly called ‘orphans’. HER2 is a bit of an incestuous orphan, being particularly fond of HER3, a close relative – and when these two are drawn into an embrace on the outside of the cell their internal blobs have to follow suit – it’s difficult to kiss while keeping your bottom halves far apart. This drawing together of the internal blobs in turn causes them to change shape – not a lot but just enough to act as a signal. For HER2 that signal is an enzyme activity: it gets turned on as a kinase – so it adds phosphate groups, specifically to tyrosine amino acids, in target proteins. It’s a receptor tyrosine kinase. Switching it on activates downstream pathways that signal to the nucleus, telling the cell to go forth and multiply. Because there are lots of signal pathways in cells that send messages in straight lines but can also ‘cross-talk’, it’s a bit like a blancmange: poke it in one place with a chemical (messenger or drug) and the whole thing wobbles. The cell as a blancmange. Receptor proteins span the outer membrane and most pass a signal from outside to in as a response to the arrival of a chemical messenger. HER2 is unusual because it works by linking with other receptors (e.g. HER3): the intracellular pathways thus activated include RAS-MAPK. Healthy breast cells have about 20,000 HER2 proteins but tumour cells may have 100 times more – i.e. 2 million receptors. So it’s easy to see that if you jack up the number of signallers by 100-fold you’re likely to have a pretty hefty proliferation push. The cells just keep on making more and more of themselves in an uncontrolled way – that’s cancer. One of the main downstream signalling pathways from HER2 is RAS-MAPK that we’ve met before as a seductive target for blocking by anti-cancer drugs. But, because multiple pathways can be switched on, hitting a single target often doesn’t work too well. The usual treatment for breast cancer is primary tumour removal by surgery followed by a combination of radiotherapy and drugs. One of the most successful drugs for treating cancers with high levels of HER2 has been trastuzumab (brandname Herceptin). Herceptin is an antibody that sticks to HER2, prevents the receptor interacting with other proteins (including HER3) and thus blocks uncontrolled signalling. The study that’s just been reported had two novel twists. The first was to try Herceptin before surgery. The second was to combine Herceptin with another drug – one that hits the enzyme activity that turns on the signal pathways inside cells. Lapatinib (Tykerb/Tyverb) is a small molecule that inhibits the tyrosine kinase activity of HER2. It’s been used hitherto where a cancer has progressed after treatment with other drugs. About a dozen kinase inhibitors currently have Food and Drug Administration approval with many more in clinical trials. Perhaps the best known is imatinib (Gleevec), used for the treatment of chronic myelogenous leukemia. 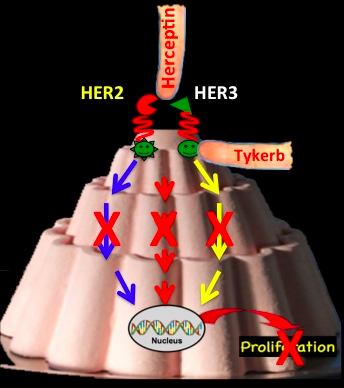 Combining Tykerb with Herceptin hits the signal pathway two different spots. The idea is to give the tumour cell two problems to overcome in the hope that it will fail. It’s a strategy that has met with some success in other settings – meaning that some patients have had extended survival times. In this study 66 women were given the combination therapy and the results clearly came as a serious shock to one and all. In almost nine out of ten cases there was an immediate response but in 11% tumours entirely vanished over a two-week treatment period. That is truly astonishing. Even in the most successful mouse experiments it is a very rare event for tumours to disappear. In a further 17% of the women tumours shrunk to less than 5mm – a growth so small it is classed as “minimal residual disease”. Poking the blancmange. Two shots at blocking signalling in a cancer cell with high levels of the HER2 receptor. Herceptin prevents HER2 interacting with other proteins, especially HER3, whilst Tykerb blocks any residual tyrosine kinase activity. A big question, of course, is why complete responses only occurred in one in ten cases – and it underlines the need to know more about what makes a tumour, as we noted last time. That aside, one very encouraging aspect is the short treatment period required for a response. Tyverb was turned down by NHS rationing bodies for not being cost-effective at £27,000 a year – much the same as Herceptin. However, the combined therapy would be about £1,500 per patient. Assuming that the complete responders really are in long-term remission, that would represent a financial transformation almost as astonishing as the biological result.